Behold: an Irish film that's too scared to go Full Irish. No real heavy drinking, no real swearing, no real violence. Only lots of 80s musical numbers and one of those girl-totally-takes-advantage-of-boy love stories. 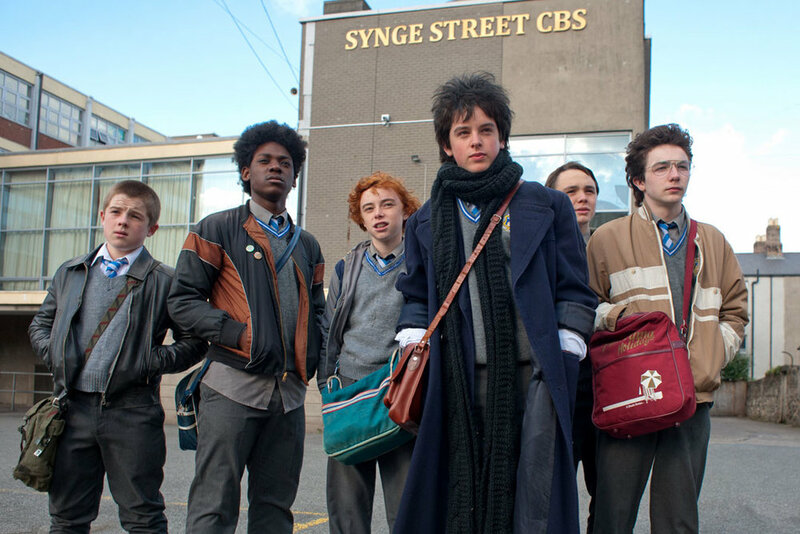 Recently appointed Austin Critic, Eddie Strait, returns to the podcast to join Alex and Julio in dissecting SING STREET - and long for the days of THE BOONDOCK SAINTS and its sequel. PHOTO: Just begging to be bullied. - If Alex isn't at work or recording this podcast or tweeting about wrestling, he's probably playing the new FRIDAY THE 13TH game. - They scared him at first, but Julio's very much in love with BEYOND THE BOX SET, a very funny podcast that he doesn't find threatening at all. - Eddie had to show off his brand new critic credentials by bragging about his screeners for THE WORK and A GHOST STORY. Coming up next: a movie that gives you everything Michael Mann's HEAT failed to deliver. It's all-Pacino, all-DeNiro, together all the time in RIGHTEOUS KILL! Until then, do the rate/review/subscribe thing on Apple Podcasts and email us at wearethecontrarians@gmail.com with your SING STREET thoughts!